Both of these low value definitive stamps were issued in 1988 and designed by Peter Adam. And both of these animals have adjusted quite nicely for living in the city. One is sleek and graceful, and one waddles awkwardly and usually has his nose in the ground. There was a time when it wasn't unusual to see these foxes in the city. Years ago there was even a three legged one that lived downtown. I always consider it a privilege to see one on my rounds at night, but they have been infrequently seen the last couple of years. A few weeks ago a young one crossed my path and I was able to follow him for several minutes as he ran alongside my car before finally darting into the woods. I was enthralled. And vowed to never again leave the house without a camera. Contrary to what many may think, most skunks don't have that perfect split white strip down their backs. There is one I see regularly that is almost all white, his stripe like a cape across his back. I've seen some that have only a white blaze on their forehead and a bit of white at the tail. Last night, I came upon one huge monster (truly he was so round and fat) with a perfectly formed white stipe that split evenly from his head to tail. I almost thought he was a thing of beauty as he rooted through the upturned compost bin. Foxes have excellent sight and hearing and are quick on their feet. His tail is almost one-third of his body length. 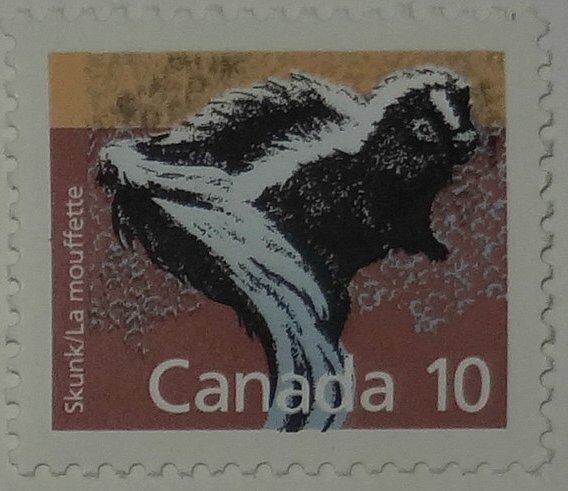 Skunks, on the other hand, are notoriously slow and near-sighted. If you see him stamp his feet and lift his tail, back away immediately. They don't usually spray unless they feel threatened, or are attacked (perhaps by a dog or car). Both animals are nocturnal and red foxes like to eat smaller animals such as voles, mice and rabbits (of which we have many thousands) and while skunks also eat voles and mice, they're also really fond of rummaging through garbage bins (of which we have many thousands). 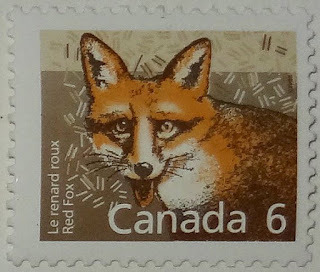 The red fox (vulpus vulpus) is found in all provinces and territories while the skunk (mephistis mephistis) can be found from Mexico to the lower parts of NWT and Nunavut and from the BC interior out to the Maritimes (but, not in Newfoundland or in Vancouver, lucky them). the crazy part was I wanted so much to go over and touch his silky fur - as if he were a cat! most skunks are kinda scraggly looking. 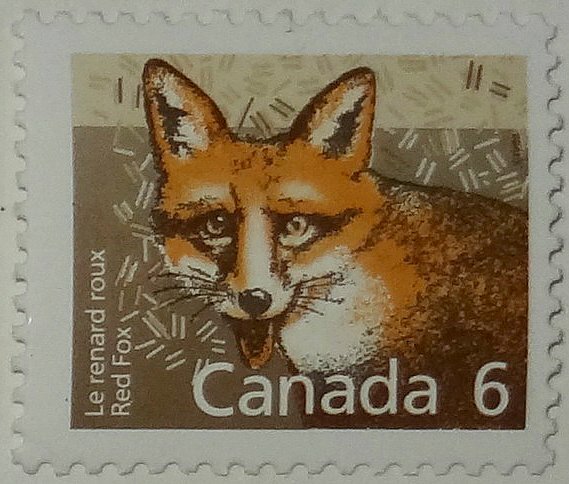 The low value Canadian stamps are really great. They might be my favorite definitives. especially the animals series! I have a set that is just for myself. Really fine stamps. We only see the occasional fox and never a skunk of course. we are getting more coyotes now, so I have wondered if that is why the foxes have moved on. a skunk's spray is something you don't want to be anywhere near - the smell is truly horrendous. My dog got sprayed by a skunk once while we were on vacation. Fortunately, it was our last day of vacation and we were able to give her a bath at my husband's aunts house, but it truly was horrific. It burned our eyes and we had to drive 8 hours in the car with that smell. I went to the pet store and bought some special shampoo to get rid of skunk smell, and still it lasted for over a week. great stamps, by the way. I'm sorry to have brought up that memory! I have hit a skunk or two, but not killed them (that is even worse, I've heard) . But yes, the smell lingers for what seems forever. Beautiful stamp designs, I love these!